During the course of the temporary exhibit on Ambrogio Lorenzetti (October 22, 2017- January 21, 2018 EXTENDED till April 8th, 2018), the Santa Maria della Scala will offer workshops and guided visits to children and their families every weekend. The activities are centered around the characters, clothes and places that appear in some of the paintings and frescoes so that one can enjoy exploring and discovering the Medieval world through the eyes of the artist. A storytelling on one of the greatest artists from Siena from the Middle Ages perfect for all ages. A story to listen to but, above all, to SEE, taking in all of the details of the frescoes and the bright golden decorations on the altarpieces. 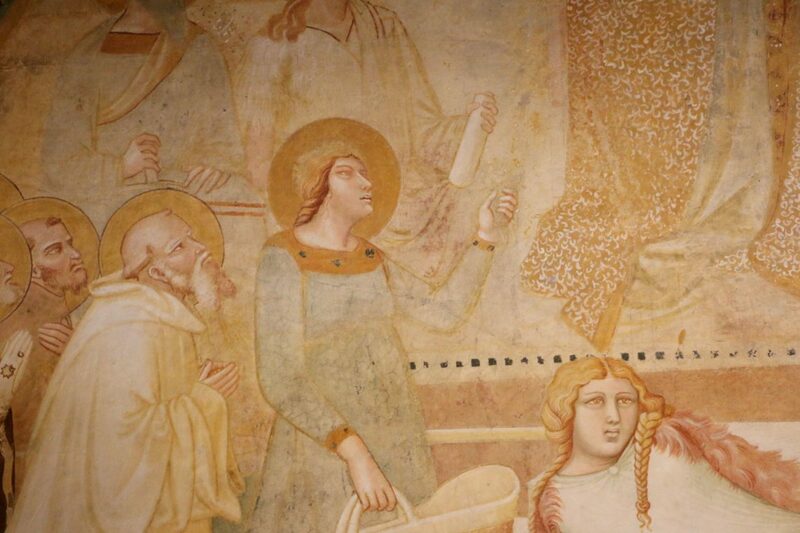 Discover the stories, which at times seem even to crazy to believe, of the saints, queens and knights found within Ambrogio Lorenzetti’s paintings. Learn to learn the subjects within by what they wear. Kids, with their great sense of observation and attention to details, will have fun creating an identity kit (life, clothing, characteristics, etc) of the characters that are found in the exhibition’s paintings. Afterward, to remember the exhibit, these “ID cards” will be collected into an album which can be looked at any time. The visit and workshop is offered for kids ages 4 to 11, but divided into two separate groups to better cater to each of the groups’ needs. Check the dates below. Travel through time between the characters and costumes of the Middle Ages as depicted in the works by Ambrogio Lorenzetti. The richly embroidered fabrics and the attentive care in which hats, boots, leggings and cloaks are painted offer workshop participants the inspiration for the children participating in the workshop to invent their own Medieval head covering from various materials. For more details or to book your visit and workshop, email bambimus@comune.siena.it. You need to book by at least 1pm of the day prior to the day of the visit but we recommend booking already if you’re interested and know you will be here. Never know if they’ll run out of spaces, so book early!